As the new year begins, we’re in the final stages of development on A Thousand Years of Night. One of the big points of this project is to provide frameworks for making history meaningful in your games. And something I love in vampire media is flashback scenes that show us our elders in previous lifetimes. In order to facilitate playing flashbacks on the spot, A Thousand Years of Night includes dynamic scenes you can insert into a session, with sample stakes, and roles for multiple players. I’d like to share a few! What better cause to persist for centuries than the unsolved mystery, the Machiavellian scheme, and the political competitiveness of Kindred? Vampires pursue intrigues lasting centuries, conspiring to one-up each other in the fields of influence, power, and blood potency. Grudges linger, mysteries expand to encompass further mysteries, and elders pull the strings of neonates attempting to wade through the morass of plots. The instigation of intrigues and the beats at which they progress construct important points in an elder’s life. When pioneers hiked the Oregon Trail, attempting to settle untouched parts of America, their unpreparedness resulted in no few casualties. Few Kindred accompanied such small bands of travelers, as scarce food resulted in rapid torpor. In this scene, a caravan comprising near 100 fur traders, animal herders and their families sets out on the Trail. The elder rides as a secret passenger. As the pioneers endure wearisome environments, sickness, hypothermia, and poor maps leading them off-track, the true horrors commence at nightfall. A band of Kindred, unlike any the elder has encountered, materializes from harsh gales and plucks the resting kine from their bedrolls. They leave only drained corpses marked with carvings for relatives to find. These new vampires intrigue and terrify the elder. They possess unfamiliar powers, and appear to be of the indigenous Shoshone. The elder may learn much from these night horrors, or question why no other vampire claims to have encountered them. The Trapper represents the mortal interests, and continues pushing them west and north, despite the dangers. His insistence that they continue moving on endangers the group. The Guide is indigenous to the region. It appears he led the pioneers in to the vampires’ territory, and the Trapper holds him responsible. In truth, he knows nothing of the Kindred, and begs for freedom. The Veteran attempts to rally a group of pioneers to go hunt the vampires. If the elder accompanies him, she may discover more of this clan. The elder risks torpor on this journey. The Kindred will not attack the elder, unless she attacks them, but they will leave her hungry after killing every mortal in her company. The elder may discover the truth of this vampire clan, if she enters their good graces by offering the kine as willing sacrifices. Such rare knowledge is powerful, though limited in its use. The Ordo Dracul and Circle of the Crone hold great interest in obscure lines and Kindred history. If the elder protects the mortals the full length of the Trail, she will have a sizeable Herd at her disposal. From this group, she could gain ghouls or childer. The elder experiences a mystery that continues to gnaw at her. Who were these vampires? Where did they go? Only in the modern nights do the Dragons and the Acolytes show enough interest to sponsor membership in their covenants, providing the elder discovers the truth. Childer and ghouls may form from the pioneer group. The Veteran, Guide, and Trapper all possess valuable skills in Persuasion, Survival, Firearms, and Animal Ken. The elder may form bonds with the secretive vampires. These will likely be Contacts, rather than Allies. If relations are fostered, introducing this clan to one of the domains along the Trail grants the vampire great Kindred Status. The Daeva believe there are few emotions as powerful as love. Some love objects. Others love causes. Vampires may love one another, or pursue the ill-fated love for a mortal. Love drives vampires to bold pursuits, and ascendancy beyond the pettiness of politicking. Love also carries tragedy on its back. When love is unrequited, a jealous vampire might strike out violently. When a foe destroys love, the elder vampire repays unkindness with ferocity. Love compels a vampire to great deeds, and foolish ends. The idea of freely expressed emotional extremes entered cultural vogue in 18th century Germany. The Sturm und Drang movement rebuked the Enlightenment’s rationalism and embraced impulse over calculation. The Kindred of Leipzig fanatically pursue the concept of forbidden love, often leading to tempestuous violence and heartbreak. The domain plunges into emotional hedonism, under the influence of the Daeva Marquis. The elder falls in love as the city rages around him. While his peers pursue human excess in twisted mimicry, he experiences true affection for another of his kind. Eager to see the relationship play out, the Marquis gives the elder the blessing to share Vitae and experience passion at its fullest. In the wings waits a jealous Ventrue, horrified to see the elder bind her childe. She challenges the elder to a duel over the childe. Without intent, the elder’s true love is pulled into Leipzig’s Sturm und Drang; another play of vengeance and passion. The Marquis manipulates the emotions of all the Leipzig Kindred with his powers of Majesty. He is decadent, and would happily see his domain ruined if it was through love, lust, and passion. He encourages every vice. The Beloved is a source of affection for her sire and the elder. Her Vinculum to the elder sways her to him, but she questions whether her affections are true. The Ventrue will not allow her childe to join the elder’s illicit union. She challenges the elder to a duel to torpor over the Beloved’s love. Passions run high in 1770s Leipzig. The elder may experience true love and gain an ally in the form of the Beloved, at the same time as developing a permanent foe in the form of the Ventrue. 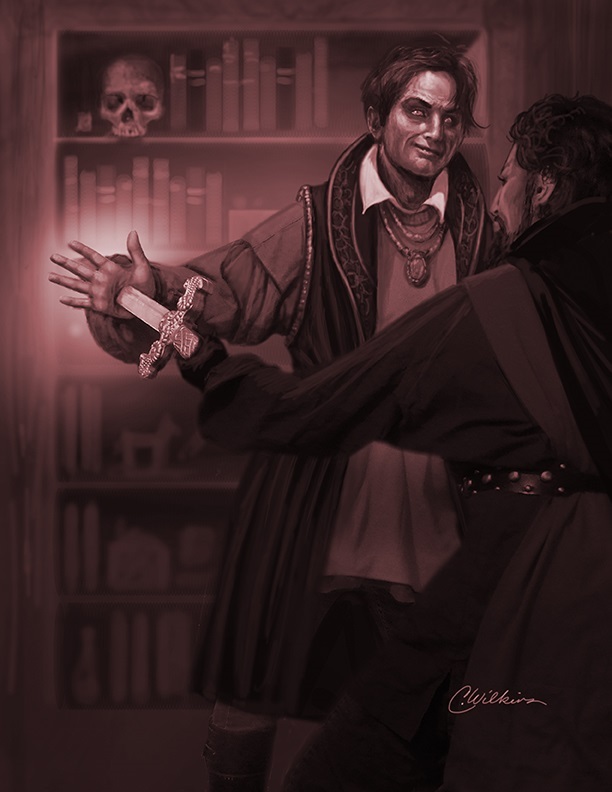 The Marquis will happily tutor the two vampires in the ways of Kindred romance, indoctrinating them into perverse blood sharing ceremonies. The Beloved will likewise tutor in her own Disciplines. The duel between Kindred results in one succumbing to torpor. In the modern nights, the loser will awake, and continue to seek vengeance. With the rise of the Circle of the Crone, the Marquis switches covenants, and attempts to bring all his students ? the elder included ? with him. Sharing blood with the Beloved assists the elder in learning Ventrue powers, as she is of that clan. If the two drink multiple times, they become Touchstones to one another. If the elder loses the duel and falls to torpor, he awakens to discover his love gone. The feelings of love still linger, so a quest to track her down naturally follows. Loving acts inspire high Humanity. If the vampires share blood, it also inspires the Obsession Condition. Concealment is the vampire’s greatest weapon. The ability to hide oneself in plain sight despite predatory urges and necessities enables the Kindred to pursue agendas and obtain blood without raising flags with hunters who would see the Danse Macabre exposed. Sometimes a vampire’s cloak of subterfuge slips, however. When that happens, the Kindred must work fast to plug the gap. In the late 19th century, Frenchman Louis Le Prince pioneered the new single lens camera, capable of recording motion. Others ? including renowned inventor and scientist Thomas Edison ? claimed credit for the discovery, yet it was Le Prince’s invention that enabled cinema to take its first step. Upon the advice of his Kindred patron, Le Prince filmed the elder feeding from one of the kine. The patron assured the elder that the recording showed only blurred motion and nothing evidencing a vampire living out her Requiem. Yet, when the short film was revealed to a coterie within the domain, the vampire’s actions were visible to all. Le Prince disappeared in France, in 1890, shortly after destroying the original version of his vampire recording dubbed “The Lovers.” The elder ? terrified her nature will be exposed for all to see ? desperately attempts to secure all copies of the recording, and silence any witnesses including the vanished Louis Le Prince. The Inventor never intended to record something monstrous on his camera. When Le Prince saw what was on his film, he destroyed the original and disappeared into the night. Though not the Patron’s ghoul, the vampire previously exerted a mental hold over Le Prince. The Patron hired the Inventor to film vampires as they fed, ignorantly assuring that a Kindred curse would protect her identity ? “the dead do not show up on film.” When the Party watch the footage, word quickly spreads about a Masquerade breach, and the quirky Patron seeks sanctuary wherever she can find it. The Party discover Le Prince’s talents, and demand he shows them his small catalogue of recordings. As they watch the elder feeding, shock infects the room. The Party give the elder one night to sew up this Masquerade breach before they sear the wound by whatever means necessary. The elder may gain a talented Retainer in the form of Louis Le Prince, or a longtime Ally in the form of the Patron, if she can provide safety to either. Conversely, she gains Status in the domain and within her covenant if she silences both permanently and destroyed Le Prince’s work. Forming a bond with the Inventor, confirming his silence and taking him from a dangerous domain, allows the elder a new Touchstone and potentially an increase in Humanity, if she doesn’t mentally subjugate Le Prince. Allowing the footage to escape into the wild increases the elder’s Fame, for better or worse. The Party either respect the elder for serving the Masquerade, or detest her for her frivolous breach. While they will not seek to destroy her, they treat her as impulsive and foolish forever after. She gains a poor reputation that never fades. If the elder maintains Le Prince’s footage, she gains dots in the Library Merit, with media-savvy vampires desirous of the recordings come the modern era. Curating the Inventor’s work grants the elder dots in Academics and Crafts. If the elder saves the Patron, she grants the elder any boon within her power. If the elder destroys the Patron, she claims the eccentric vampire’s Haven and dots in Resources. The Patron was an Unaligned loner, with no close companions to kick up a fuss following her death. Rare as it may seem, Kindred occasionally perform feats of heroism. Any sapient being is capable of throwing himself on the grenade to protect his friends. Only at the depths of humanity do murder and callous cruelty appear reasonable actions. Neonates are more likely to behave based on modern moralistic behavior than elders, but elders learn much from their descendants. The dedicated fledgling who saves an elder’s life may deeply affect the older vampire. The elder who sees a mortal child in danger and against better judgment, plucks her from the grip of the city Sheriff, is in his own way heroic. Heroism contributes to a vampire’s reputation, for better or worse. Not all seek the mantle of “hero,” but few deny the impression it leaves when declared as such. In the mid-18th century, the Kingdom of Ireland suffered the Year of Slaughter. Following years of frost and damp, followed by drought and poor harvests, nearly 40% of the Irish population succumbed to starvation, hypothermia, or disease. The elder exists in this domain, a bystander as kine wither and die around her. Most of the Kindred flee to healthier shores as Ireland rots, but the elder remains, caretaker over her people and determined to outlast the Year of Slaughter. A choice faces the elder. If she sacrifices personal wealth and uses her Disciplines on the correct people, she may be able to ensure food from grain ships reaches those who need it. Alternatively, if she bides her time and waits for the kine to grow weaker, she can play robber baron with the grain stores and docklands domains, only conveying the food to those she chooses. The Baron is a mortal with massive grain stores, withheld from the starving masses for the use of his own family. The Baron locks himself away and hopes to weather the frost, ignoring the cries of the people outside. The elder may seek to emulate this mortal, or manipulate him into gifting his stocks to the people. The Priest represents the Church of Ireland, and at great sacrifice, arranges the distribution of coal and meat. The Priest is aware of the elder’s nature, and humbles himself, asking that with all the vampire’s gifts, she do something to stave off the nation’s hunger. The Rioter is hungry, angry, and supported by a small army of starving Irish. He intends to raid the next ship in the docks for its stores, even though doing so may prevent future ships from docking. A passionate and charismatic mortal, the elder may twist his anger into service, or convince him to pacify his people. The elder may become a hero in this scene, or profit from the kine’s misery. By ensuring the people remain fed and healthy, the elder is acclaimed and revered as a champion to the common folk. The loyalty engendered causes kine in the know to offer their services as ghouls, with the Priest and Rioter as potentially useful retainers in the future. Both carry influence in different areas. If the elder cares little for the dreadful ongoing situation, she gains from the weakened kine. Feeding becomes easier, the mortals more desperate and willing to abase themselves for mercy and the smallest kindnesses. The heroic path leads to a depletion of Resources and Contacts as the elder expends her power to strengthen the domain’s kine. She does however benefit in the long-term, as the kine remember her for her kindness. The elder gains dots in Empathy, for her close proximity to the suffering mortals. The path involving less sacrifice makes feeding easier in the short-term, as the kine put up little resistance. Dots in Allies increase as the Baron and other peers respect the elder’s restraint. Other vampires resent the damage the elder does to the Irish kine. The elder gains dots in Manipulation and Subterfuge for controlling the mortals’ chances of survival, though her Humanity decreases. As one of few Kindred remaining in the domain, she claims Kindred Status and title within her covenant, gaining dots in Politics. I’m not sure what to think of these from a gameplay perspective, since I don’t know exactly how the risk and rewards are supposed to factor into the present-day chronicle. The idea of a vampire as a Touchstone doesn’t sit right with me but that’s not a biggie. That said, these are some pretty solid hooks with strong feelings of place and time. Looking forward to the full book! The flashback scenes can impact the construction of your character in the modern era. It’s explained fully in the book, not to worry! A chance for my character to die and then go “wait, no, that isn’t how it happened, let me start over”? Too bad I don’t get a time manipulating dagger. Although it might still be workable if your modern day character is impersonating a long-destroyed elder. I find it’s generally impossible to not have the character die in the backstory of an undead character. I adore these mechanics; Thousand Years of Night is a book I’ve wanted for Vampire since it launched, and doubly so once I realized I could readily steal rules from it for Mummy. Here’s hoping we could see more previews soon! Will there be Flashbacks for non-Western time periods and settings? I know most of VtR has a focus on Europe and the Americas, but a couple of these elsewhere in the world (something from pre-Colombian American, please!) would help flesh things out and inspire. There are indeed flashbacks for non-Western settings. I’ve written something for every continent. The earliest flashback (from memory) is the 8th century, in Scandinavia. I am also very excited about the flashbacks! I love doing flashbacks and I look forward to doing it in an elder chronicle. I have promised my players a massive elder chronicle with entire ungoing flashback stories, so this is something I find very useful and intriguing. As written it will probably serve more as inspiration than be used as is. For me flashbacks have to have a more personal character, as the personal is often the focus of my stories. And I think it would be fantastic with tragedy and personal conflicts as flashbacks. I love how Requiem 2nd Ed. has a strong focus on the personal (and also other stuff, of course) and I truly hope you think it into this book. I would prefer a personal focus when doing and elders game compared to power fluff. Actually, now that I have read them again, and more carefully, I can see that you have included many aspects in the flashbacks. I would like to amend my statement and say: They look awesome! Someone was asking in the forums if we can expect new disciplines or merits.